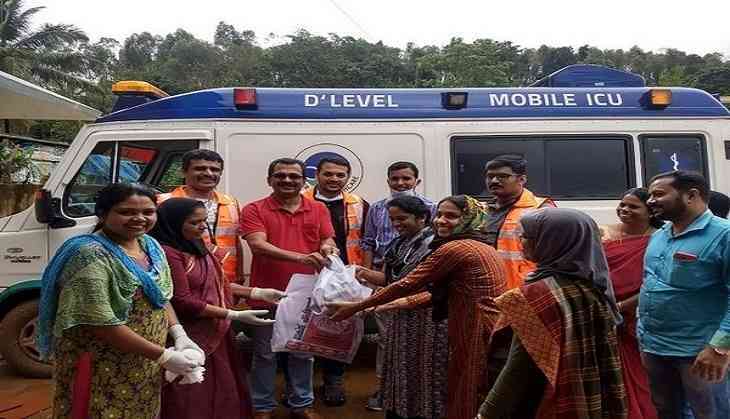 With lakhs of Keralites displaced, and over 350 losing their lives due to floods caused by rains and landslides, relief and rescue operations are underway at war-footing across the state to restore normalcy. Aster Volunteers have reached remote areas where proper support is yet to arrive, they are helping people with medical checkups, clothes, blankets, food and water. Aster Disaster Support Team, consisting of more than 300 medical and non-medical volunteers from Aster DM Healthcare's network of hospitals in India, has been working with local government relief centers in Wayanad, Ernakulam, Calicut and Malappuram districts to conduct medical camps, provide health check-ups and essential materials for sustenance. Dr. Azad Moopen, Founder Chairman and Managing Director of Aster DM Healthcare said, "This is to place in record greatest appreciation to all those who actively took part in the timely, efficient and compassionate medical care and allied support provided to the victims of the unprecedented flood-related tragedy. I am proud that Asterians have been in the forefront of the efforts with commitment and service. The Government, with Hon CM leading from the front with the support of thousands of volunteers, forces, officials and healthcare workers did a fantastic job to mitigate the damage that was caused by the mother of all floods. The Aster Volunteers can be proud of our timely involvement and contribution, especially in the relief camps providing badly needed medical care." He added, "The job is only half done, the phase one of providing immediate care to the affected people in the camps is over. The more important part of the intervention is in phase two, with a significant risk of communicable diseases. Contaminated water sources can be a major threat to GI illnesses like diarrhea, typhoid, hepatitis etc. Prevention and treatment of these maladies is of paramount importance and Aster Volunteers must be at the forefront of combating this." He further said, "I request the coordinators to work closely with the authorities and provide manpower and materials wherever required. The disposal of biomedical waste is being supported by IMAGE ( Indian Medical Association Goes Eco-Friendly), a wing of IMA (Indian Medical Association). Government is providing the required immunization materials. Request all of you to be actively spending the time to prevent any aftermath of the tragedy, which can prevent more morbidity and mortality. Let us be on red alert regarding this in the forefront of the crusade against this natural disaster." • Co-operate with rescue workers, health authorities and doctors. Discuss your problem frankly and work out the best solution.